Wikipedia defines “zombies” as “animated corpse[s] raised by magical means, such as witchcraft.” In modern parlance, these undead former friends walk endlessly, seeking out brains of the living on which to feast. If they eat your brains, you don’t die, entirely. You, too, become a zombie. Zombies are common in sci-fi/fantasy stories, comic books, and horror flicks — which, don’t worry, are all fiction. Throughout the history of mankind, there have been a grand total of zero zombie sightings confirmed by anything remotely resembling science. 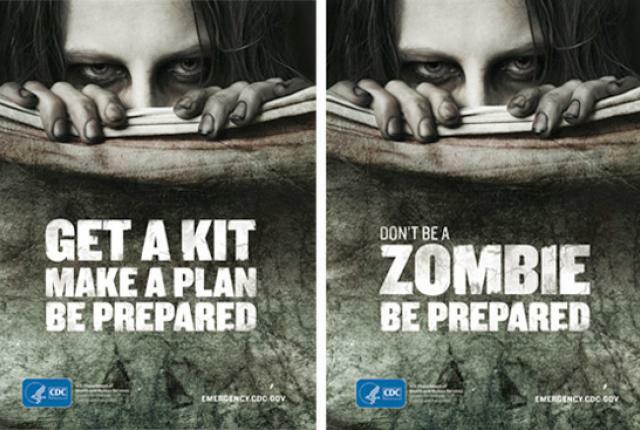 But the U.S. government wants you to be prepared for the zombie pandemic anyway. Really, they even have posters. From the Archives: Waffling: A neat way the U.S. determines how bad a disaster is. Related: “The Zombie Survival Guide: Complete Protection from the Living Dead” by Max Brooks, son of Mel Brooks and a former Saturday Night Live writer. 4.4 stars on a handful over 1,000 reviews.